Today I'm thrilled to present the cover of my upcoming epic Arthurian fantasy novel, Pendragon's Heir. So, some background on the cover: I started off making this myself, and after many tweaks, came up with a design I liked. Except that out of nowhere, I got an email from a friend and designer with an impressive portfolio, who wanted to paint something in the style of Howard Pyle and NC Wyeth, and wondered if I'd like him to make me a cover. Just as I was certain I'd finished the job myself, I suddenly had professional help. Unsure what to do, I showed him my cover. He agreed it was a good concept, and offered to make some tweaks (I'll discuss them in more depth in a minute). But the best part? Because he didn't get to paint me a cover, Isaac offered instead to draw three black-and-white illustrations for inside the book! COO ER GOSH, Y'ALL. I'd like to thank Isaac Botkin for all his kind help--not just with the cover and illustrations, but also with drop caps for the interior and various other aspects of the design. It's been a privilege to work with him, and thoroughly encouraging to have his support with this project. 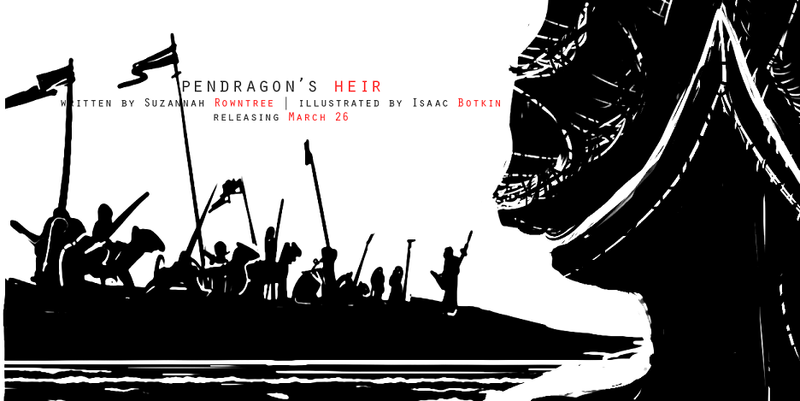 The Pendragon's Heir cover design process was quite a long one, and I'm going to walk you through it, because while writing a novel is usually mind-numbing hard work, cover design is actually pretty fun. Hello Vintage Novels readers! This week I'm pleased to present guest poster Bessie Blue of Vintage Book Life with an article on the fascinating--and for a long time, top-secret--Stratemeyer Syndicate. Having enjoyed the odd Nancy Drew and Hardy Boys book in my younger days, it's a real pleasure to host Bessie Blue with some background details. If you read Nancy Drew, the Hardy Boys, or the Bobbsey Twins as a child—or as an adult—you may be vaguely aware that these series were penned by ghostwriters. But the truth is much more intriguing. These series, and more than one hundred others, were created by a secretive organization called the Stratemeyer Syndicate. Founded by Edward Stratemeyer at the turn of the 20th century, the Syndicate was neither a book publishing nor a packaging firm as it was sometimes referred to. It was instead the brains behind the thousands of children's books that would become the most-read kids' novels of the twentieth century. In fact, more than five million copies of Stratemeyer novels were sold between 1899 and 1926. In the Victorian Era, children's books were frequently imbued with moral values. An example of this is the still-popular novel “What Katy Did” by Susan Coolidge. It features a tomboyish girl who learns to be a woman after becoming temporarily handicapped. Edward Stratemeyer realized there was a big market for children's books without moral lessons. His first try at filling this demand was with The Rover Boys, in 1899. The series was incredibly popular, and in 1906, the Stratemeyer Syndicate was formed. But Stratemeyer also discovered that he sold better under a pseudonym, and he began to write his Rover Boy books under the pen name 'Arthur M. Winfield.' He also branched out into other series such as The Bobbsey Twins and Tom Swift, using other names like Laura Lee Hope and Victor Appleton, respectively, and teaming up with other publishers. His theory was that since readers believed they were buying different series written by different authors and published by different firms, he could produce more without overloading the market. However, Stratemeyer soon found he could not continue alone to juggle the writing of so many series to fulfill readers' demand. At this point, he began to hire ghostwriters. Hundreds of men and women soon began working on outlines that Stratemeyer—and his two daughters, Harriet and Edna—were writing. They were each payed a fixed sum that equalled about three months' of a newspaper journalist's wages. Meanwhile, Stratemeyer earned the massive ongoing royalties from each novel. 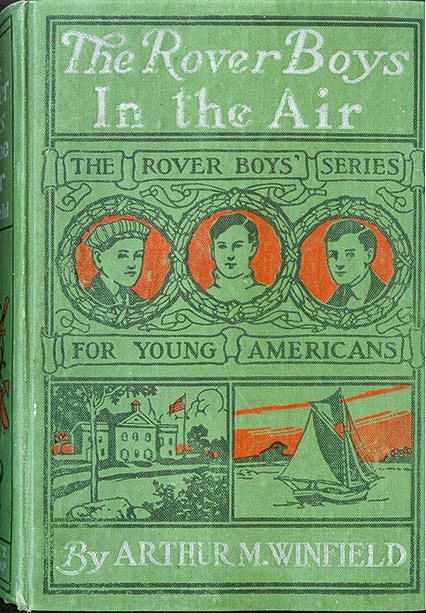 While Stratemeyer published different series in different firms—such as Grosset and Dunlap and Cupples and Leon—he also promoted reader loyalty by using pen names throughout decades-long series (for instance, the aforementioned Rover Boys lasted twenty-seven years, without counting other Rover Boy-inspired series such as The Putnam Hall Cadets.) Plus, he used those same pen names in other series, so that readers who were a fan of one series would buy another that the same, fictional author had written. For example, Laura Lee Hope, the pseudonym behind The Bobbsey Twins, also supposedly wrote The Outdoor Girls, The Moving Picture Girls, The Make Believe Stories, Six Little Bunkers, Bunny Brown, and The Blythe Girls. It's easy to see why this pseudonym was kept for the six series, as their readers were all either young children or girls. Stratemeyer didn't just create publishing guidelines—his keen business acumen also played into the writing of the more than one hundred series he was responsible for. By seeing what worked in his novels and what didn't, he created rules that can seem odd to us today but that had a real business impact on the Syndicate series. For instance, when sales dropped after popular Nancy Drew forerunner Ruth Fielding (1913-1934) grew up and married, Stratemeyer created a new rule indicating that protagonists couldn't marry. Similarly, in the first Bobbsey Twins books, Nan, Bert, Freddie, and Flossie were a year older in every installation. Stratemeyer realized they would soon age out of the books, and this led to a new rule: protagonists couldn't age. These commercial guidelines were what kept Nancy Drew eternally eighteen and romantic subplots in the books always underdeveloped. Stratemeyer made use of a number of other business tricks in his books: he encouraged writers to recap previous novels in successive ones as a form of marketing, and to use cliffhangers at the end of every page and chapter. Novels felt formulaic, with an information-giving title (Ruth Fielding at Silver Ranch tells you it's going to be a location-oriented story, while Nancy Drew and the Mystery of the Old Clock tells you it's a mystery story.) The predictable plot and likable protagonist also play into the comfortable nature of the series. While the Syndicate rode the school-story fad initially, it abandoned it for a new trend: the mystery story. This was popularized in the late 1920s and early 1930s, with new series like Nancy Drew, while mysteries were incorporated into old series like Ruth Fielding and The Bobbsey Twins. Today, the mystery trend might be what the Syndicate series are most remembered for. In 1930, Stratemeyer died, and the organization was passed onto his daughter, Harriet. She continued to oversee the Syndicate for fifty-two years, revising and republishing old and outdated series to make them more modern. In the 1970s, she decided to republish Nancy Drew in paperback. However, her decision had a fatal consequence: one of the Syndicate's publishing houses, Grosset and Dunlap, took them to trial, citing breach of contract, and exposed them to the world. Until then, the Stratemeyer Syndicate had done everything it could to remain as secretive as possible. Again, this was important because to avoid market overload, readers could not know the real source of different series. Apart from Benson, hundred of others contributed to the Syndicate series, and while they were paid very little initially, Stratemeyer gave them part of the series' royalties in his books. So the ghostwriters' stories had a happy ending, after all. Many novels by the Stratemeyer series are in the public domain and can be read online. You can read The Rover Boys series here and Ruth Fielding here. Bessie Blue is a lover of old books who writes at Vintage Book Life. So, this week I was planning on reviewing Owen Barfield's History in English Words, a philological classic from one of the rarer Inklings. Unfortunately, though, some things have come up, and I'll have to postpone that review in favour of a poem. James McAuley has become one of my favourite poets. This is odd for two reasons. The first is that he is a recent poet, having died less than fifty years ago. The second is that he is Australian, and for years I was unaware of my native land having produced anyone quite so spectacularly good (not even Banjo Paterson). As I've explained in a previous post, McAuley took a long and fascinating journey to become one of the most controversial poets in Australian history, a staunch Christian and anti-modernist, before being more or less hushed up and forgotten after his death. Today I'd like to share a recent favourite poem. McAuley's style is a little different to many of my favourite poets; he keeps most of his poems short and tight, using words with splendid economy. The real beauty of poetry lies in saying volumes in just a few brief words that conjure up a whole host of harmonious but diverse meanings, allusions, and echoes, so that one line of poem is like the plucking of a string. One does not simply hear a sound; one hears the whole spectrum of lesser vibrations, the third, fifth, and octave of the original note, resounding slowly into silence. That is what reading good poetry is like, and with McAuley's poetry, the effect is particularly notable. Another thing that recently struck me about McAuley's style is its grace. I'll have another go at describing this quality when I review History in English Words, but for now, let me just describe it as something best experienced in Middle English poetry, medieval chivalric romances, John Bunyan's The Pilgrim's Progress, and the like. 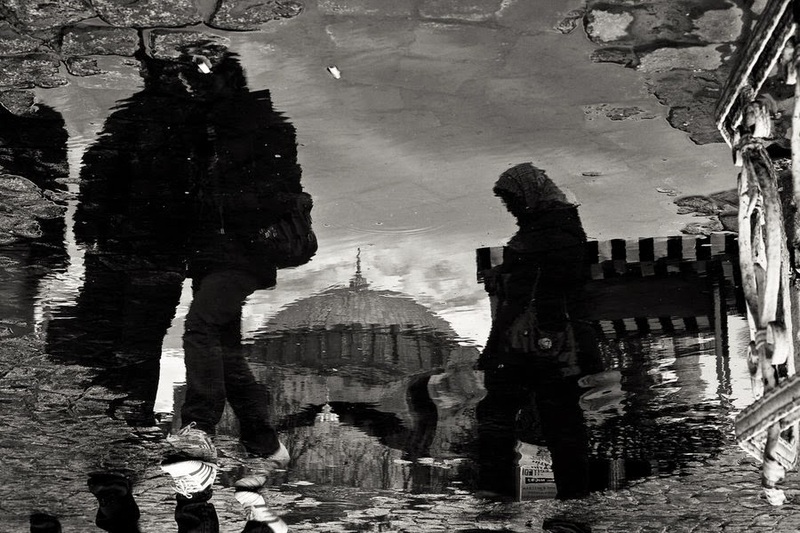 It is courtesy in the old Spenserian sense, meaning honest affection shown from a sincere heart. Not merely politeness, but kindness, courtliness, and nobility. Most modern authors, even Christian authors, even my favourites, do not capture this quality. James McAuley does. And do not know these things? With clear light from above. By which the spirit gains. The novelist Nevil Shute, an Englishman who settled in Australia in 1950 and wrote the famous Australian novel A Town Like Alice, is one of those authors I seem to have spent much of my life for the last couple of years avoiding. Incidentally, I have a few books which glare at me judgementally from the bookshelf, whispering You know I'm an Important Novel. That's the only reason you aren't reading me. Besides A Town Like Alice, the two that immediately spring to mind are To Kill A Mockingbird and The Name of the Rose. Peter Moran hasn't flown an aeroplane for ten years, when one night on his way home across the Sussex Downs to the estate he manages, he comes across an RAF pilot he knew in the Great War. At first, Maurice Lenden tries to give a false name, but then bit by bit his story comes out. After years failing to make ends meet in England as a professional pilot, Lenden finally took a job with the Soviets. And when they offered him a thousand pounds to fly back to England in the dead of night and photograph the mysterious installations in Portsmouth harbour, he never imagined he had become a spy until it was already too late to turn back. As British Intelligence searches for the pilot of the downed spy plane, Peter Moran must choose between his country and his friendship. So, there was a lot that I liked about this novel, as well as a lot that I didn’t. Chewing over why I didn’t like what I didn’t like has been thoroughly informative, though, so I call it a net profit. I'm going to go into plot details from here on, so if you want to avoid spoilers, go and read the book first. Parts of it were very absorbing. Shute writes well when his narrator is playing the piano or flying a plane (as an aeronautical engineer, he knows enough to make the planes real characters in the story). The foreshadowing is very effective, and the last three chapters were gripping enough to dim the memory of the rather pedestrian plot up to that point. On the other hand, the characterisation was unsatisfying. The plot depends on the narrator, and many other key characters, deciding to help Lenden to great personal disadvantage, but for no apparent reason. For this to work, the character of Lenden needed to have some palpable charm. But I didn't feel it, and none of it rang true. I also particularly relished the specific manifestation of patriotism which the book presented. The narrator feels nothing for England, but he feels a very particular love for his own small part of it, Sussex. His patriotism is not a jingoistic affair, because it isn’t ideologically motivated. Instead, it’s motivated by thoroughly practical, solid things: Cows. Land. Neighbours. Also, there were a few other thoroughly lovely things in this book—meditations on beauty, courage, and perseverance. But there was one thing that rather spoiled it for me. I got my first inkling that something was wrong within the first few pages of the book, when an Author’s Note cropped up in which Shute rather apologetically explained that he wrote this novel in his early days, you know, back in the days when he still thought it was a good idea to write about spies and adventure and similar conceits. As someone with a rather melodramatic and unabashed love for these things, I began to read with a sense of foreboding. (Shute’s Note reminded me of all the Amazon reviews I read of one of my least-favourite books ever, Zorro: A Novel. All those Amazon reviews apologised, blushing, for having stooped to read a swashbuckler. But it’s alright! This one actually had literary pretensions! We were able to enjoy it in a highbrow manner! The novel was, of course, the worst swashbuckler I have ever read). 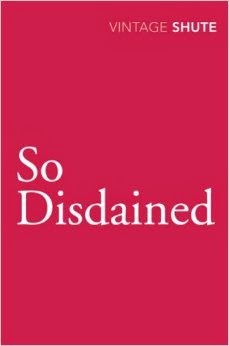 So Disdained was not, to my relief, the worst thriller I have ever read. Shute makes periodic attempts to write a spy thriller, and in those passages, he mostly succeeds, although I thought the character of Stenning (who turns up in the last couple of chapters and oversees the climax with two-fisted zeal) was equal parts uncomfortable and cheesy, like an escapee from a particularly fruity Alistair MacLean novel. But despite periodic success with the thriller, I felt Shute’s heart wasn’t truly in the genre. He didn’t have a good ear for what worked, and he was much too interested in lengthy discursions on unrelated topics, more suited to realist lit fic. The plot just doesn’t hang together well; the law of conservation of detail is abandoned from the start. I tend to think that most lit fic has terrible plotting, but for a thriller, this was particularly bad. For example, somewhere around the midpoint of the novel, the narrator meets a supporting character who only appears in that scene. They have a long discussion, and then as an afterthought the supporting character gives the narrator a letter. That letter turns out to be a crucial link in the plot. Nothing else in that scene—the supporting character, the long discussion—ever comes up again. All this would be bad enough, except that by the end of the novel, I began to suspect that Shute had abandoned the idea of writing a thriller and had decided to write a deconstruction of a thriller. There is a thrilling, death-defying journey taken by the narrator from England, where he kisses his fiancee tenderly goodbye, wondering if he'll ever see her again, to Italy, where after a couple of hours she turns up, having followed him by a laughably easy route. She brings with her the aforesaid Alistair MacLean escapee, who then takes over and does all the theatrical stuff we would expect from the narrator, which is a shame because the narrator would not have been half so hammy, him being more of a classic antihero and all. What made me suspect most strongly that this book was a deconstruction, however, was the fact that the plot achieves very little. By the end of the book, three main stakes have arisen in the plot. The two biggest are resolved around halfway through the book, leaving only the third for the climax. Lenden rushes off to Europe to catch the photographs which he doesn’t realise have already been sabotaged. The narrator rushes after to waylay him and prevent him walking into certain death on a fool’s errand, arriving just in time to witness Lenden's perfectly pointless death. At the end of the book, I think I’m supposed to find it touching that Lenden insists on opening the packet and destroying the photos as he lies dying—unaware that the narrator has already destroyed them. I don’t find it touching. It's a shoot-the-shaggy-dog-story. That is if you look at this novel as if it’s a thriller. However, if you look at it as lit fic—that is, if you cease to see the external action as a metaphor for the internal action—if you look at it as lit fic, and just pay attention to the characters’ inner journey, then it becomes apparent why this is a triumph for Lenden. He has gone from being someone who doesn’t care at all, to someone who will give his life self-sacrificially for a cause. He dies at the end, but he dies complete. So Disdained is an odd creature. It’s a terrible thriller, but it’s actually a nice bit of lit fic. In a thriller, we expect the outer action to be an outworking of the inner action. A thriller about a man regaining his patriotism would see him achieving some great goal for his country, with or without the cost of his life. The triumph of his inner journey would be expressed in the triumph of his outer journey. In lit fic, the rules of the thriller genre don’t apply, and we’re able to focus on and appreciate the inner journey despite the total futility of the patriot’s attempt to serve his country. Or can we? Can the inner journey really be detached from the outer journey like that? So Disdained is basically unsatisfying, because no matter which way you slice it, Lenden dies on such a fool's errand that the patriotic message is rendered hollow and cynical. Is Shute's discomfort with the thriller genre the thing that makes this novel so uneven and undecided between genres? Do his more "literary" works succeed better in making a point without sacrificing good storytelling? Maybe I'll have to read A Town Like Alice to find out. Find So Disdained on Amazon or The Book Depository.